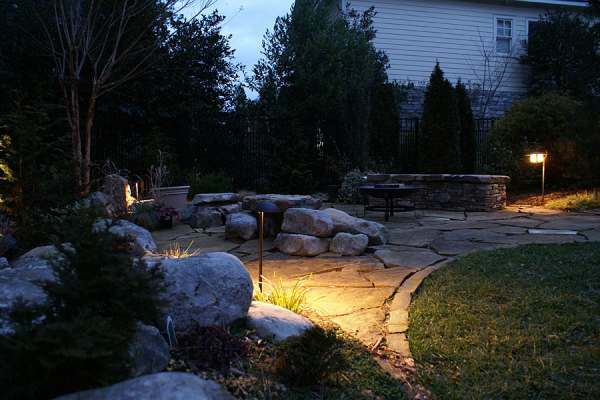 Enjoy more great ideas in backyard landscaping photos 3. We'll be adding tons of new pictures for 2015. 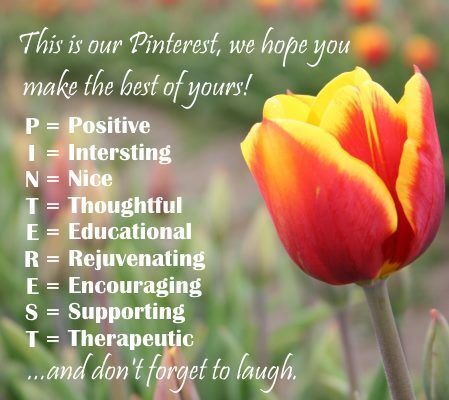 Don't forget to follow us on Pinterest where we have over 16,000 landscaping pictures categorized on over 80 different boards. See why nearly 200,000 people are following us already. You can see what Dream Yard has on over 200 pages of information by visiting our site map. flower bed at the end of the pool. Click on any backyard landscaping photo to open a gallery slideshow of all the photos on this page. 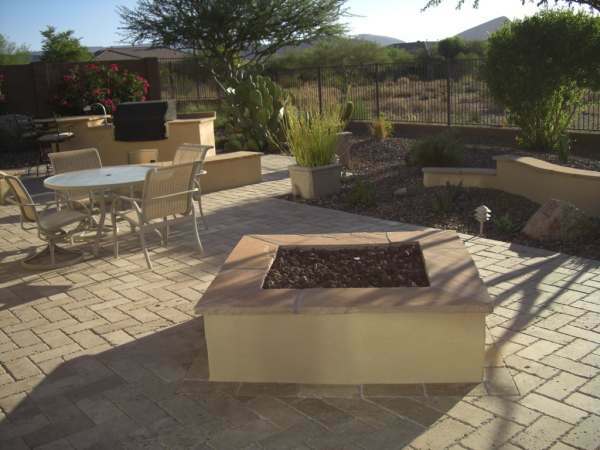 Don't forget to visit our landscaping how-to modules if you are doing it yourself. If you have are landscaping a steep bank or landscaping a slope in your yard, you can visit our picture ideas section for landscaping on a slope. Thanks so much and enjoy. A colourful and well planned backyard as seen from this elevated patio area. 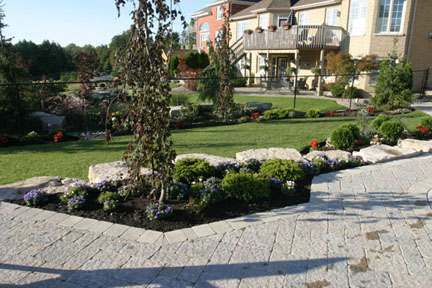 Large natural stones support the garden beds as they transition into the raised patio. These newly planted beds will fill in nicely over the next couple of years. grass is a nice touch to the corner. from the same stone as the flagstones. 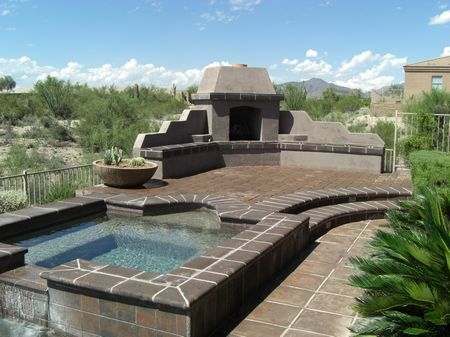 A nice firepit area with a hot tub in the background. Notice the perimeter of the yard with gravel beds and shrubs to soften the privacy walls. making features like this very practical. A nice untamed view of a wide open desert directly behind this backyard. 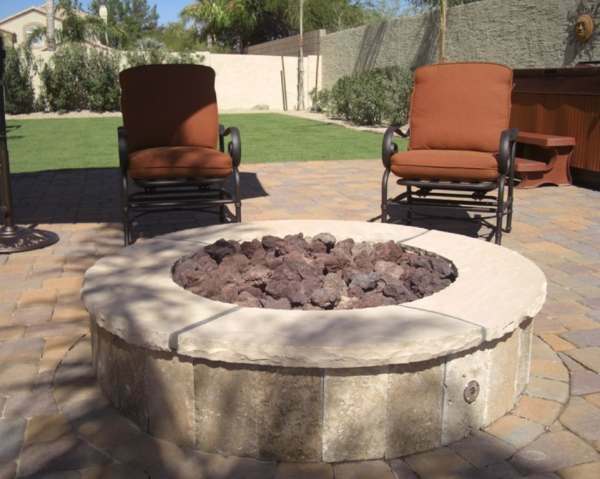 A corner fireplace with built in seating stands like a protective barrier to the yard like a fortress. An upper and lower pool feature joined by a small cascade. 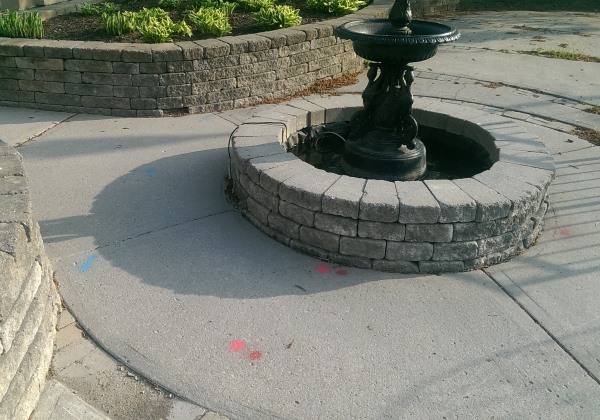 A nice water fountain provides the soothing sounds needed to relax on a patio.